The kitchen is the heart of your home. It is important that you not only choose the right furniture and appliances, but also the right kitchen worktop. Each type of kitchen worktop has different materials which have their own advantages and disadvantages. Choosing the right one can make a big difference in terms of style, practicality and durability. Here at CKS Frimley Green, we can help you to choose the perfect worktop for your kitchen. With many different types available, you have plenty of choice and freedom to experiment with your design. 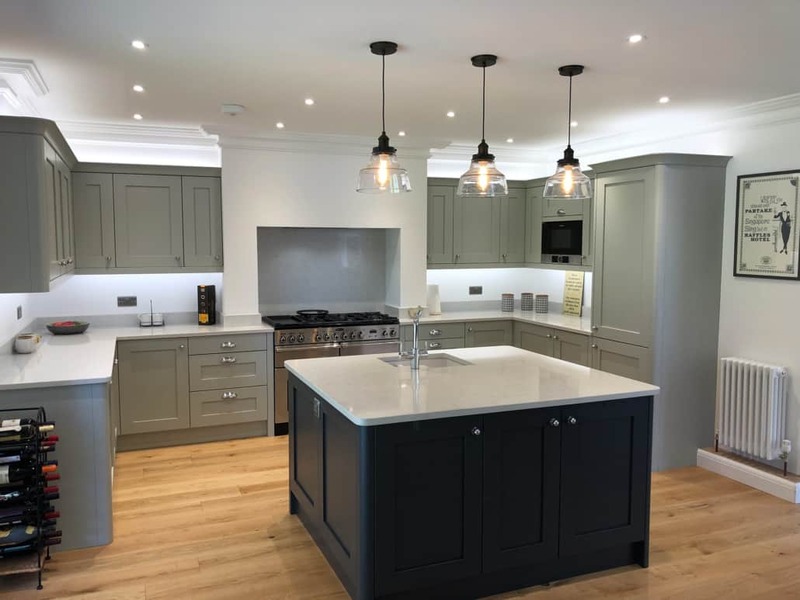 Whether you are upgrading your existing worktop or installing a brand new kitchen, we can help you to determine which one will benefit you. Some of the most widely used kitchen worktops we supply are; Granite, Solid Wood, Quartz- Silestone/Cimestone and Laminate- Duropal. Below is some information about each type of kitchen worktop which may help you to decide which one will suit your needs and requirements. Granite is a popular choice for a kitchen worktop, this is because it is stylish and a natural stone which has a distinctive and timeless feel about it. Granite is available in a wide range of different colours and finishes, making it perfect for those who want a worktop to match their kitchen design and colour scheme. A key advantage of granite worktops is that they are waterproof, strong and extremely durable. The downside of granite is that it is one of the most expensive materials and maybe quite porous and stain easily. This can make it harder to clean and maintain compared to other worktop materials. Solid wooden worktops are hugely favoured amongst homeowners throughout Surrey and the rest of the UK. Solid wood is known for adding charm, warmth and character into your home and can be used for both traditional and modern styles of kitchen. Wood is timeless and elegant, it can be customised to fit in with your existing design and will never look outdated. Solid wood is also very easy to clean, maintain and repair, making them last for many years. Quartz, also known by its brand names Silestone or Cimestone as two of the companies we use, is a man-made material. Made with natural quartz and combined with resin, Silestone worktops are designed to be extra strong with a hard wearing surface. Quartz worktops are sometimes mistaken for granite, although they are somewhat similar in appearance, they are actually very different. Quartz is completely non-porous and will not stain or absorb liquids like a granite worktop might. The stronger surface of quartz will help to prevent scratches and chips, making them extremely durable and hard-wearing. The smooth, waterproof finish makes quartz very easy to clean and maintain, thus very hygienic and easy to use. Quartz worktops are available in a wide range of different colours, giving you plenty of choice for your kitchen. Laminate, also known by the brand name, Duropal is a cost-effective choice for a kitchen worktop. Laminate is made by wrapping fibreboard in a hard laminate coating, this creates a lightweight worktop with a durable surface. Laminate is available in an extensive range of colours and styles and can imitate other worktop materials. Key benefits of laminate worktops are, they are scratch resistant, simple to install, easy to replace and suited to all budgets. Laminate is also hygienic and easy to clean as the smooth surface has no grooves to harbor dirt or bacteria. The downside of laminate worktops is that they are not heat resistant or fully waterproof so they can become damaged more easily compared to other materials. Here at CKS Frimley Green we have a large collection of different worktops available for your kitchen. If you would like to know any more information about our kitchen worktops, please do not hesitate to contact us. We will be happy to answer any of your questions and give you advice about your upcoming kitchen project. The areas we cover are, Frimley Guildford, Camberley, and Farnham. We look forward to hearing from you.